More freedom of information lawsuits were brought against the federal government in fiscal year 2014 than in any year since at least 2001, according to a new analysis of court records by the Transactional Records Access Clearinghouse (TRAC). A total of 422 Freedom of Information Act suits were filed in federal district court last year compared with 372 in FY 2013 and 387 in FY 2005, the next highest year since 2001. These counts represent all cases where the nature of suit is listed as FOIA, the law that requires federal agencies to disclose records to any person making a written request unless the records fall into one of nine categories of exemption. TRAC issued a report in 2013 on traditional news media’s use of FOIA lawsuits, finding that from FY 2005 through FY 2012, traditional media brought between three and nine FOIA suits a year. Some newer media organizations and individual reporters are joining the ranks of FOIA filers. For instance, Jason Leopold, a reporter with VICE News, filed eight FOIA suits in FY 2014. Shane Bauer, a reporter for Mother Jones, filed two suits, which the FOIA Project wrote about in a Case Spotlight. Former CBS reporter Sharyl Attkisson also brought a FOIA suit on her own in FY 2014. Neither Mother Jones nor VICE News were listed as parties in the Bauer or Leopold suits, although Leopold said VICE News has been backing his cases since he became a staff writer there in August. Also bringing suit in FY 2014 were ProPublica, Muckrock, and the company that publishes of the Washington Examiner. BuzzFeed is among the new media organizations that has brought suit early in FY 2015. Leopold said that filing FOIA requests has been a regular part of his work as a journalist, first as a freelancer for prominent news outlets, and now for VICE News. He said he is suing more for records than he used to, and finds that agencies are becoming less responsive to FOIA requests. He has already filed seven additional FOIA suits in the first first few months of 2015. Leopold said he has always been surprised by how little FOIA is actually used by journalists. “I often hear that it just takes too much time to get the records,” he said. He combats the delay by focusing on stories import enough that they will rise to the level of news regardless of when he wins the records release. He also builds a pipeline of requests so that he is always receiving records. And if an agency does not respond to him in 20 days,he sues right away, particularly if he is after documents he suspects the agency will not ultimately turn over without a fight. Leopold remarked on something the FOIA Project also found in examining the lawsuits filed in FY 2014: advocacy groups of various stripes file FOIA suits more often than media. Judicial Watch, for instance, which describes itself as “a conservative, non-partisan educational foundation,” filed more FOIA suits in FY 2014 than anyone, with 34 suits in which it is the plaintiff, and several others on which it is serving as counsel. Up next would be various chapters of the American Civil Liberties Union, with a combined FY 2014 total of 10 FOIA suits, the Electronic Privacy Information Center with 7 suits, and the Energy & Environment Legal Institute and Free Market Environmental Law Clinic, both with 6. Chris Farrell, director of Research and Investigation for Judicial Watch, said one of the reasons the organization sues so frequently is simply a matter of volume: the organization currently has 2,800 pending open government requests and lawsuits at both the federal and states levels. “The other reason is that sometimes suing is simply the only way to get the agency to pay attention a request,” Farrell said. He said that’s not true of every agency, and praised the Department of Transportation for being particularly responsive. Who are the defendants in these suits? The Department of Justice tops the list – as it has done in every year for which the FOIA Project has records. It also had the largest jump in the number of suits filed – from 83 in FY 2013 to 121 in FY 2014. 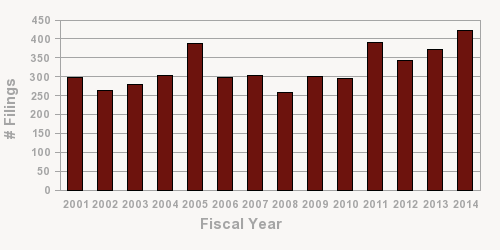 On average, Justice has been hit with 81 FOIA suits a year over the 14 years of data compiled by the FOIA Project. It has been sued under FOIA 101 times per year over the last five fiscal years. Its previous highs were 109 in both FY 2011 and 2012. The numbers for Justice include its suborganizations, such as the FBI. Knowing exactly what government entity the plaintiff has issue with is difficult because suits often only list the department-level organization, such as Justice, and not the sub-level organization, such as the FBI. The Department of Defense, which had the next highest number of FOIA cases, also showed a sizable jump – from 38 in FY 2013 to 54 during FY 2014. This pushed DOD into second place, surpassing the number of suits filed against the Department of Homeland Security, which was hit with 49 FOIA suits in FY 2014 and 48 in FY 2013. In FY 2014, specific DOD suborganizations were named in 26 suits, including the Army (named in 10 suits), the National Security Agency (9), and the Navy (5). Specific Homeland Security suborganizations were named 23 times, including Customs and Border Protection (named in 17 suits), Immigration and Customs Enforcement (7), and the Federal Emergency Management Agency (5). The above analysis is based on federal district court records available at foiaproject.org. This unique website is updated daily and at last count contained more than 22,127 court documents from 6,140 district and appellate court FOIA-related cases. Please read this important discussion for data definitions and more information about how the FOIA Project captures and processes court records. Two considerations more specific to this report worth mentioning are that (1) entities sued frequently under FOIA typically receive lots of FOIA requests, so the frequency at which they are sued is not necessarily reflective of their compliance with the law, and (2) as we can see in Figure 1, there is a lot of year-to-year fluctuation in the number of FOIA suits filed, so it is unclear whether FY 2014’s increase is evidence of a new trend. As previously reported by the FOIA Project, it appears that FOIA lawsuits have increased during the Obama administration over the levels during the last term of President Bush. The FOIA Project is administered by the Transactional Records Access Clearinghouse (TRAC), a nonpartisan data research center that is a joint center of the Newhouse School of Public Communications and the Whitman School of Management at Syracuse University. The project depends upon volunteers, gifts, and grants, and its supporters have included the CS Fund/Warsh-Mott Legacy, Ethics and Excellence in Journalism Fund, Atlantic Philanthropies, Stewart Mott Foundation, OpentheGovernment.Org, William B. Wiener Jr. Foundation, JRS Dryfoos Charitable Lead Trust, and the Peter and Carmen Lucia Buck Foundation.